Alcoholics Learn To Make Their Own Beer In Canadian Program : The Two-Way In a twist on the old "teach a man to fish" adage, a Vancouver group teaches inveterate alcoholics to brew their own booze. The goal? Keeping them from drinking unsafe liquids that contain alcohol. Call it a new twist on the old "teach a man to fish" adage. 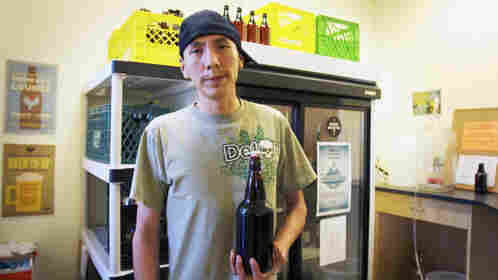 A group in Vancouver, British Columbia, is teaching inveterate alcoholics to brew their own beer and make their own wine, in an attempt to keep them from drinking unsafe liquids to get an alcoholic high. The project is the work of the Portland Hotel Society, which works to help people who suffer from mental illness and addictions in downtown Vancouver. News of the beer and wine project is spreading weeks after the publicly funded group's Drug Users Resource Center unveiled a coin-operated machine that dispenses crack pipes for 25 cents. The Portland Hotel Society's leaders say they want to provide safe alternatives to people who might otherwise be forced into risky and unsafe behavior — everything from shoplifting booze to drinking any substance they can find that contains alcohol. "Obviously, we'd rather they didn't drink," the society's executive director, Mark Townsend, tells the Vancouver Sun. "But if they do, we'd rather they didn't drink hand sanitizer." The brewing program, which began about six months ago, requires participants to make several commitments in exchange for about five liters of home-brewed beer. Townsend says that in addition, they also get a sense of pride and achievement in making their own beer. The brewers each pitch in $10 and work in groups of four to produce beer or wine in a style of their choosing — this week, they were making Dutch lager and a honey lager; a chardonnay was to be uncorked Friday, reports Canada's National Post. During the process, they're supervised by a brewmaster. The participants must also attend the regular Friday-night meetings of the "Drinker's Lounge," a support group that also includes an alcohol-swapping program that Townsend compares to a gun amnesty system. Members can bring containers of rubbing alcohol, for instance, and exchange them for regular drinks. "We're just trying to do what we can with no resources to make them a bit safer, make our community a bit safer, hopefully keep them alive for another day," Townsend told the Sun, "and with a possibility of not drinking in the way they do." The brew-your-own program has been a hit. One participant tells the National Post that it's "more economically viable than buying it at a liquor store." Soon the program will move past the brewing kits it's been getting from a home-brew supply store nearby, and make the beer from scratch. And the folks at the Portland Hotel Society say the brewing program is growing. "As the drinking community becomes aware of what we're doing, we're obviously having to expand the program," Drug Users Resource Center Director Kailin See tells the National Post.